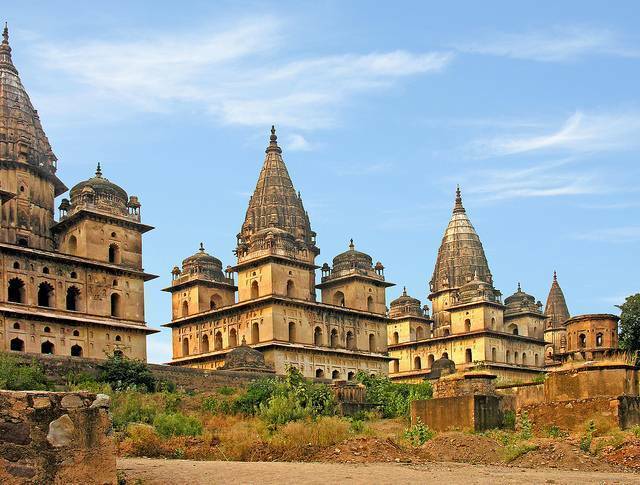 These are 14 cenotaphs (or Chhatris) in Orchha are tombs, in memory of the Bundela kings and the members of their dynasty. They are located near Kanchan Ghat on banks of River Betwa. The cenotaphs have been bulit on the spot where royals were cremated. Some of these cenotaphs or Chattris are of Vir Singh Deo, Madhukar shah, Udait Singh, Jaswant Singh and others. Cenotaph of Vir Singh Deo is the most popular of all because of its unique architecture and beautiful design. Each Chhatri is a little different in design. The structures are triple-storied. Four chambers make up a dome shaped covering surrounded by small cenotaphs resting on columns.